There were kindred souls all around, milling through aisles of books on books on books. My first stop: the poetry section. The section was in the far back area of the warehouse, against the left wall. The selection consisted of mostly American authors, anthologies, compilations, old issues of literary magazines, some E.E. Cummings, Louise Glück. I haven’t read The Prophet yet but I’ve heard of Khalil Gibran. Quite a lot actually, some of his quotes have become really familiar. I was in an Issues in Lesbian Relationships class at one point and our professor quoted Gibran on love so memorably. Let there be spaces in your togetherness, and let the winds of the heavens dance between you. Love one another but make not a bond of love: Let it rather be a moving sea between the shores of your souls. Fill each other’s cup but drink not from one cup. Give one another of your bread but eat not from the same loaf. Sing and dance together and be joyous, but let each one of you be alone, even as the strings of a lute are alone though they quiver with the same music. I came to spot another book right after, an earlier collection of poems by Terrance Hayes. I got his most recent work How to be Drawn when I was in Seattle last year, and I’ve been smitten with his work ever since. I looked around more, and realized that the fiction area made my head hurt seeing the endless rows of paperbacks and hardcovers. Where to start? The choices were overwhelming, and there really was no order to all the beautiful chaos. On my way to the other side of the warehouse, I stumbled upon a small section of which I naturally gravitated to: philosophy. There were tons Heilbroner’s The Worldly Philosophers, lots of Nietzsche, “Concepts of Man” and other Marxist texts. I was hoping I would be able to see at least a copy of any Alain de Botton book – not for myself but for a lucky bibliophile out there whose life was about to be changed. I came upon a book by Erich Fromm though, another writer I came to know through bell hooks. I don’t remember when I read The Art of Loving but I knew that his ideas stuck with me — I couldn’t pass this up. The selection was quite small so after ten minutes, I moved on. There was also a “literary biography” section: Capote, Eggers and about twenty copies of Gilbert’s Eat, Pray, Love strewn around. I’ve always been fascinated with the lives of writers — how and where they write, what their daily lives looked like, if they took walks, if they had day jobs. I remembered this infograph on the daily routines of famous creatives. I already have a copy of Audre Lorde’s Sister Outsider but I couldn’t resist another one. Audre has been rally influential and her poetry has saved me numerous times. Just like most queer woman of color, her words have been inspiring and I have a deep affinity to Audre’s work. 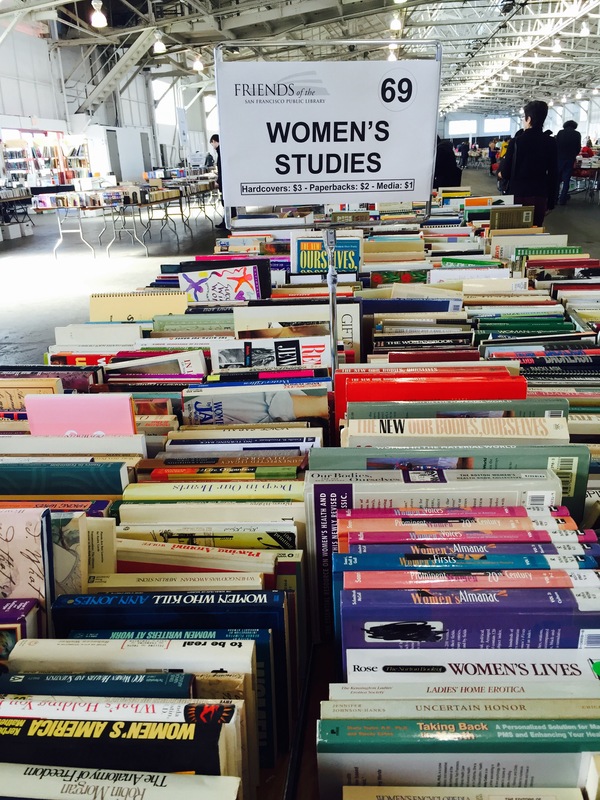 There were some more books by bell hooks, (bourgeois) feminist reads, and Suze Orman (really?). Even though no one was browsing at the table when I was there, its existence was a testament to the need for more voices and writings of, by and for women. Any recommendation from de Botton will be embraced, and anyone who reads this blog can attest to why. As much as I would’ve loved to get more, I knew that my cup was truly filleth. I headed over to the cashier to pay for all the good stuff I found in just thirty minutes. Best $11 I’ve ever spent. 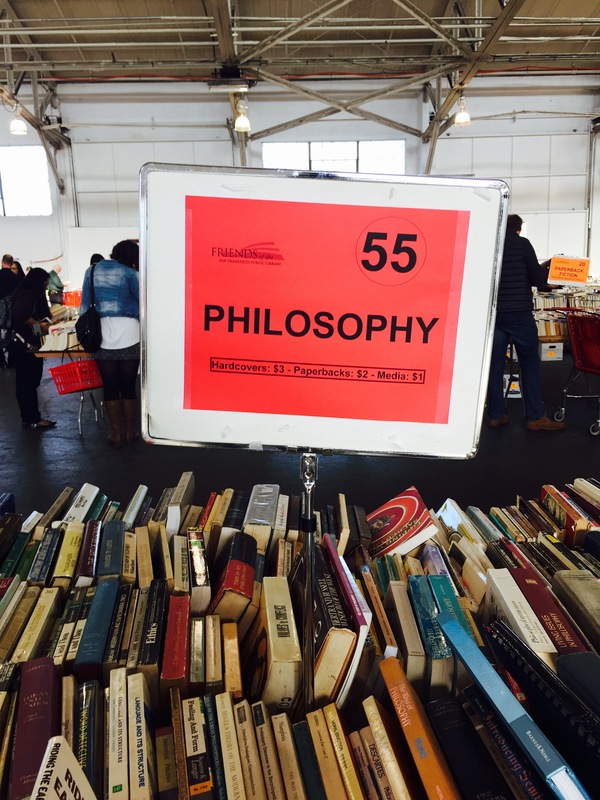 The San Francisco Big Book Sale runs today until 6:00 pm at the Festival Pavilion at Fort Mason. Everything is a dollar so hurry! Can’t comment with photos here…How would you like me to share?